The City Council is holding a hearing today on the financial impact of the Amazon HQ2 deal and $3 billion public subsidy package. You can make your voice heard through a public comment on the City Council website. 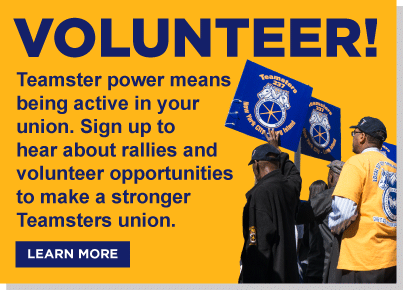 As a proud Teamster, I am worried about the effects HQ2 is going to have on New York’s economy. Teamsters have built up standards for drivers and logistics workers in the NYC area for decades and we are now giving the key to the city to Amazon that is notorious for low pay and unsafe working conditions. What assurances will the City demand from Amazon that they adhere to our higher standards instead of creating a disastrous race to the bottom? I am a longtime Teamster Local ### member who is able to work and live in NYC because of the unions’ fight to maintain living wages, benefits and working conditions that support my family and community, I cannot understand why hardworking taxpayers are asked to fork over $3 billion and public property to the world’s richest company and richest man while we are told to beware by the company’s hometown — Seattle — about bringing the wolf to our doorstep. It’s tough enough making ends meet living in NYC, so imagine my fear about what happens as Amazon spreads across the city. How will NYC workers continue to afford to live anywhere near our jobs, after standards continue to drop because of Amazon’s low pay for its rank-and-file spreads throughout the city economy? Teamsters stand for fair treatment of all Amazon workers from the employees at HQ2 to the warehouse workers in Staten Island. While the $150,000 jobs that Amazon promised for HQ2 sound great what about the thousands of Amazon workers and contractors that will struggle to make ends meet in NYC? The answer for workers is to go UNION.